October 23, 2017 – While meteorologists continue marveling at the startling imagery and data from NOAA’s new Geostationary Operational Environmental (GOES) satellite, GOES-16, progress continues on the remaining satellites in the series. When GOES-16 launched in November 2016, it was known as GOES-R but was renamed GOES-16 once it reached geostationary orbit. 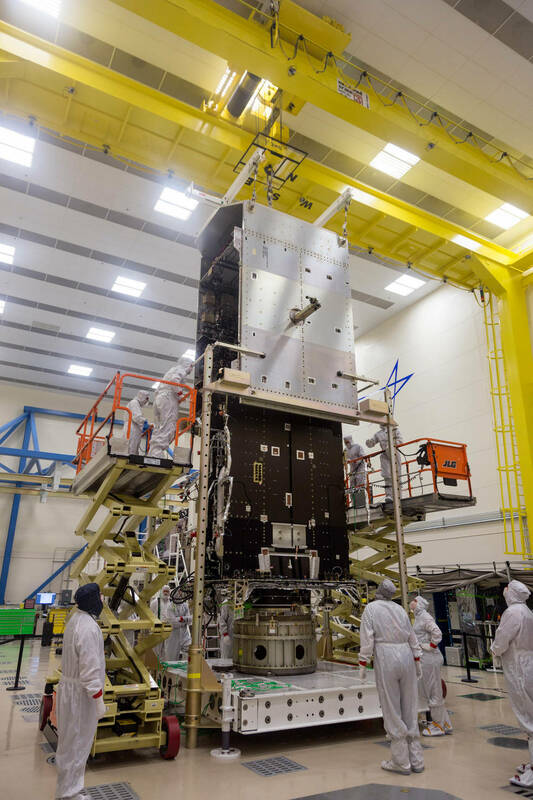 The next satellite in the series, GOES-S, is now fully integrated, finished with environmental and mechanical testing and preparing for launch in spring 2018. Meanwhile, the primary subassemblies of the GOES-T satellite were recently brought together in a successful mate operation. The “mating” of the GOES-T system module and core propulsion module occurred on September 22 at Lockheed Martin in Littleton, Colorado. As part of the mate process, the system module, or “brain,” and propulsion module, or the “body,” of the spacecraft were merged together to form the integrated GOES-T spacecraft. More than 70 electronics boxes mounted within the system module provide the functionality to operate the spacecraft and its six instruments. The core propulsion module forms the main central structure of the satellite and carries the propellant and thrusters needed to maneuver the spacecraft after it is separated from the launch vehicle. GOES-16 resides in a central checkout orbit of 89.5 degrees west longitude, where it is in its extended validation phase. Current plans are to relocate GOES-16 to its operational location at 75.2 degrees west longitude in December, replacing GOES-13 as GOES-East. GOES-S will join GOES-16 in geostationary orbit next year and will be designated GOES-17. The GOES-R satellite series consists of GOES-R, GOES-S, GOES-T, and GOES-U. This series is more advanced than the previous GOES fleet in that the imager can scan the Earth five times faster, at four times the image resolution, with triple the number of channels for more accurate, reliable weather forecasts and severe weather outlooks. They will also provide critical solar monitoring and space weather observations.